32 mm polished and satin finish stainless steel case, screw-down crown with the TUDOR rose in relief and black anodised aluminium winding crown tube, polished smooth bezel, sapphire crystal, black dial, Calibre 2824 self-winding movement, approximately 38 hours of power reserve, satin-finished stainless steel bracelet. Water resistant to 500 ft (150 m). Hans Wildorf, after successfully launching the Rolex watch brand, decided in 1926 to introduce a second line that his sales agents could sell at a more modest price point while maintaining high standards of dependability. He called these timepieces Tudor in tribute to the vintage Tudor period in England U.K. It incorporated the Rose and shield logos in the design of the dials. Tudor was an early adopter of bright colors for timepieces such as orange and red and in the 1960’s the navy of France used Tudor Water Proof Submariner watches for their divers. In 1997 Tudor hires golfer Tiger Woods as a spokesman and his chronograph watch was extremely popular. 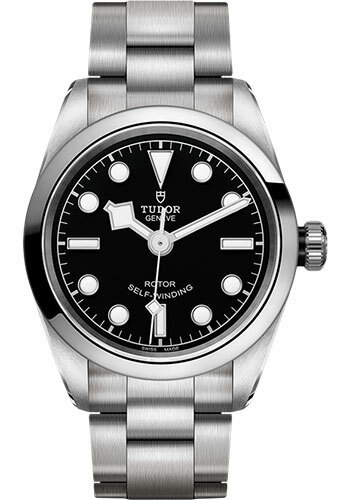 In 2015 Tudor returned to the USA marketplace and current wristwatches include the Heritage Black Bay, Ranger, Pelagos, Chrono Blue, Gantour and Fastrider Blackshield.